Michael and John Daly won out with Mountbellew-Moylough and the Salthill-Knocknacarra team managed by their father Val. Corofin's Kieran Fitzgerald and Mountbellew-Moylough's Joe Bergin will be in opposition in next month's Galway county final. TWO GALWAY CLUB footballers won the bragging rights over their father – a former two time Allstar – in today’s Galway senior football semi-final at Tuam Stadium. Former Tribesmen boss Val Daly was in charge of a Salthill-Knocknacarra side that were soundly beaten 1-12 to 1-7 by a Mountbellew-Moylough panel featuring his two sons, Michael and John. Victory propels Mountbellew-Moylough into the Galway senior football final against the reigning All-Ireland club champions Corofin, who were far too classy for Cortoon Shamrocks in today’s first semi-final at Tuam Stadium as they emerged commanding 2-11 to 0-7 victors. The final will be a repeat of the 2009 decider between the clubs which went to a replay before Corofin triumphed. Corofin will be bidding to complete a three-in-a-row while Mountbellew-Moylough last lifted the crown in 1986. In the first semi-final, Galway senior Gary Sice contributed two goals for Corofin, who dominated the second half as Cortoon were easily defeated. 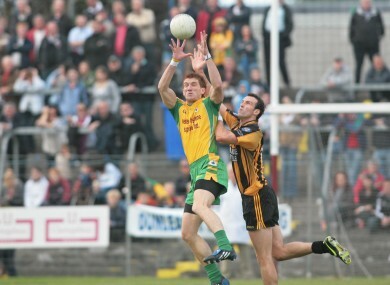 There had been signs of early promise from underdogs Cortoon, but Corofin were never in any danger after the restart. Cortoon crafted 13 first half scoring chances, but they were only able to take four which was a significant issue before the break. At the opposite end Corofin were a bit more clinical as promising youngster Dylan Wall dashed about craving involvement. Fine scores from Martin Boyle and Joseph Donnellan edged Cortoon 0-4 to 0-3 in front, but Corofin responded before the break. Martin Farragher restored parity with an excellent point and Corofin then pounced for a splendid 29th minute goal. Kieran McGrath’s clever turn and fisted pass released Gary Sice, who burst through to rattle the Cortoon net. Corofin substitute Greg Higgins made an instant impact kicking two splendid points as Cortoon were comprehensively outplayed. Leading 1-7 to 0-6 by the 43rd minute Stephen Rochford’s team subsequently added points from Jason Leonard (2) and Michael Farragher before Sice’s second sealed the deal. In the second semi-final Mountbellew-Moylough claimed a fully merited 1-12 to 1-7 triumph over a disappointing Salthill-Knocknacarra. A lively Mountbellew-Moylough dictated the pace and pattern of the opening period as they went in 1-6 to 1-2 in front at the break. Eoin Finnerty, Joe Bergin, and Cathal Kenny registered early points for Mountbellew-Moylough, but Salthill-Knocknacarra responded. An Eoin O’Mahony point was followed by an 11th minute goal from Marcus MacDonnachadha following sharp work from Shane Maughan. But Mountbellew-Moylough recovered and led 0-6 to 1-2 before Eoin Finnerty drilled a smashing goal in first half stoppage time. Kenny and Finnerty stretched Mountbellew-Moylough’s lead and while Shane Maughan kept Salthill-Knocknacarra in the game the winners finished strongly. Barry McHugh and Cathal Duffy nailed late scores to seal the deal as Mountbellew-Moylough, with Joe Bergin effective, held out. Email “Brothers win out against father in Galway semi-final to set up decider with All-Ireland champs”. Feedback on “Brothers win out against father in Galway semi-final to set up decider with All-Ireland champs”.